Backless carrels have a desktop and sides walls only, so you can place them against walls, partitions or shelving units. Or, two students or a student and a teacher can sit face-to-face and work together. These are perfect for language lessons or tutoring sessions. Stand-alone carrels do simply that. You can place them anywhere in your classroom or library to provide students with a private work area. Most models are available in starter and adder units so you can create entire rows of study carrels. Starter Unit – Each starter unit has two side walls. You'll need at least one starter unit to begin your row. An Adder unit has only one side wall and attaches to a starter or another adder. Adder units are usually a little cheaper than starter units; you'll save money and space when compared to buying several stand-alone starter units. All study carrel rows that use adder units must have at least one starter unit. Portable carrels have walls only and do not include a desktop. 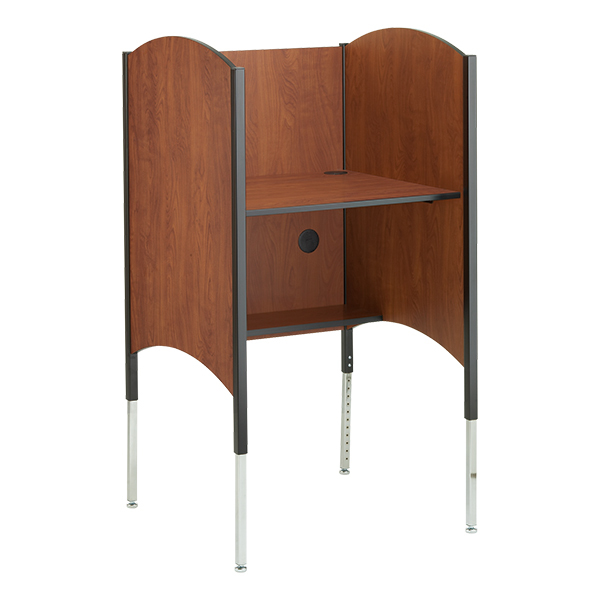 You'll find full-length portable carrels that fit around a desk or half-size portable carrels that fit on a tabletop. These are a great choice for classrooms with limited space. Most study carrels are available in fixed height or adjustable height. Fixed-height study carrels cannot be moved up or down, so the worksurface is always at the same level. A common worksurface height for adults and older students is 29 inches. Adjustable-height study carrels are great for learning spaces that are accessed by students of different ages. You can adjust the legs to raise or lower the worksurface so that any student can study comfortably. Some adjustable-height study carrels are available with special legs that adjust from 25 inches to 35 inches and meet ADA requirements. Tabletop Height – You'll find some portable carrels that are roughly half the size of standard carrels, so you can place them on a table or desk. Laminate - Most study carrels have laminate walls and worksurfaces. Laminate is easy to wipe clean and looks attractive in your library or classroom. You can usually find study carrels with laminate walls in traditional wood tones or contemporary neutrals. Fabric – Some models have sound-absorbing fabric side panels. Fabric is lightweight and often tackable, so it functions as a bulletin board as well. Some study carrels have panels that extend to the floor, but many are supported by tubular steel legs. Steel is measured by gauge; the lower the gauge, the stronger the steel. You may want to upgrade your study carrels to make them a better fit for your classroom. Accessories like power strips, light fixtures and wire management tray are available on some models for an additional charge. View all of our study carrels. Have a question? Give us a call at 1-800-260-2776 for shopping advice or to place a phone order.